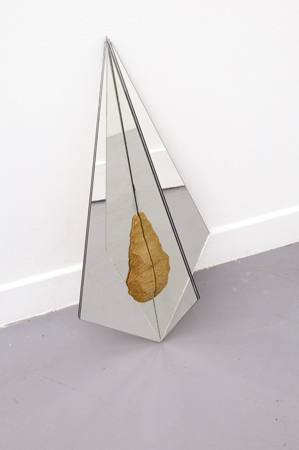 (2009) Paleolithic flint, mirror, aluminum. Tulip Hysteria Coordinating (working title) is a structure composed of an authentic prehistoric tool (dual faced Paleolithic flint) cut into four parts according to the object’s own symmetry. 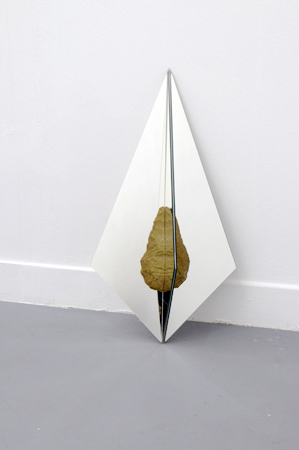 Those four parts are joined together again on an aluminum structure of which the measurements are calculated proportionally from the stone’s shape and each surface is covered by mirror. The sculpture points out the symmetric principal that was the main criteria in the creation of such tools and that distinguished them from any other stones, as being the first evidence of proper human activity. The working title was borrowed to an announced work by a famous artist of the 20th century, that was never carried out. It will be replaced by a definitive title once found.